The members of KKF around the world went to Charlotte, North Carolina, to attend the KKF year-end meeting from 14-16 December 2012. The KKF Chapter in North Carolina had done a wonderful job to host the meeting with more than hundred participants successfully. In the morning, the KKF Board of Directors and its advisors met for a retrospective meeting to evaluate the results of 2012 and set forward the plan for 2013. Dr. Joshua Cooper, KKF Advisor, talked about his works to advocate for the Khmer-Krom’s rights in 2012 and briefed about his trip to Cambodia during the ASEAN meeting. In the afternoon, the special guest, Dr. Scott Flipse, Deputy Director for Policy and Research of the United States Commission on International Religious Freedom, arrived and talked briefly to the KKF Board of Directors about how to help KKF leaders to advocate for the religious freedom of the Khmer-Krom in Vietnam more effectively. In the late afternoon, Mr. To Kim Thong and Mr. Tran Mannrinh talked about their trip to Cambodia on November during the ASEAN Meeting. In the early Evening, the members started arriving. The pre-meeting opens up for the members to express their concerns and suggestions to the KKF leaders. In the morning, after a formal meeting opening by KKF Chairman, Mr. Thach Vien from France, Venerable TT Dhammo, KKF Director of Religious Affair, led the Buddhist chanting to pray for the victims of the Sandy Hook Elementary shooting. 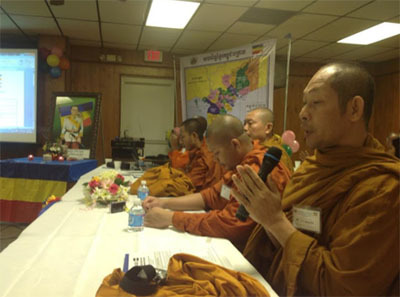 The Buddhist monks attended the meeting also shared and blessed for the victims’ families to overcome the tragedy. Mr. Thach Ngoc Thach, KKF President from Canada, presented a presentation “March to Freedom” to talk about the activities of KKF in 2012. The KKF Director, KKF Regional Presidents also presented the reports of their 2012 activities to the members. Mr. Kok Ksor, President of the Degar Foundation, expressed his appreciation for inviting him to talk at the meeting. He was really happy with the cooperation between KKF and his organization because we all share the common issue: the human rights violations against our people. He looks forward to work with KKF leaders to raise the issues more effectively to the International spotlight. Former United States Ambassador to the Democratic Republic of East Timor, Grover Joseph Rees, talked about the institutional culture of the foreign ministry and relationship among governments. Ambassador Rees discussed about how to present the Khmer-Krom issues effectively. He also reminded the KKF members to use their power as the US citizen to bring the Khmer-Krom human rights violations to the US politicians. Dr. Scott Flipse talked about how his organization has helped defending the religious freedom for the people in Vietnam. He mentioned that he already had two trips to Khleang (Soc Trang) to talk with the Vietnamese officials regarding to the religious freedom violations against the Khmer-Krom. He expressed emotionally about why he wants to help the Khmer-Krom Buddhist monks who were arrested, defrocked, and imprisoned in Khleang in 2007. When he heard those Buddhist monks told him how they were tortured in prison, he could not stand it. He said that the Vietnamese religious leaders who had been arrested and imprisoned in Vietnam, none of them were tortured. To help brining the Khmer-Krom issues effectively to the US government, Dr. Flipse suggested KKF members should contact and write letter to their congressman/congresswoman urging them to help raising the religious freedom violations against Khmer-Krom in Vietnam. He also suggested that KKF should send representatives once a month to Washington DC to meet other religious freedom advocacy groups to join them raising the religious freedom violations around the world which is also included the issues of the Khmer-Krom. Ms. Sara Colm, former Human Rights Watch researcher, talked about the fundamental rights that the Peoples must have and relate them to the human rights violations against the Khmer-Krom. Ms. Colm brought up a very important point that the Khmer-Krom in Mekong Delta will be facing is the affected of the Global Warming. She pointed out that if the sea level keeps raising, the Mekong Delta will be flooded and the Khmer-Krom people have to move away from their homeland. Vietnam has been receiving funds to preventing the affected of global warming. She suggested that KKF needs to make sure that the Khmer-Krom people are included in whatever policies that Vietnam put into action. Dr. Cooper gave an excellent talk about how he and KKF had worked together to bring the Khmer-Krom human rights violations at the United Nations meetings (CERD, CRC, UNPFII, EMRIP) and lobbied the governments around the world. He also talked about his trip to Cambodia in November to teach human rights for the Khmer-Krom youths and Khmer-Krom Buddhist monk students. He showed the picture of his class using the candle light to learn Human Rights because the Cambodian government turned off power to preventing him from teaching the human rights class to the Khmer-Krom. After the special guests spoke, there was an open discussion for the members to ask questions to the speakers. 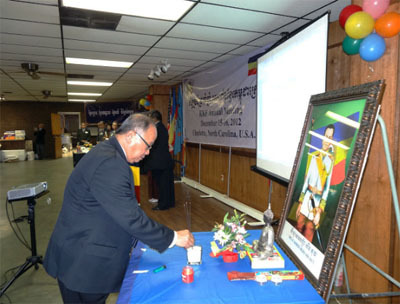 At night, the North Carolina KKF local chapter hosted a Party to welcome all the participants coming to the meeting. In the morning, the KKF regional and local presidents who did not present their reports in Saturday continued to present their reports. The KKF Women team, led by Mrs. Son Thi Nit, KKF Director of Women, presented their activities report. The KKFYC team, led by Serey Chau, KKF Director of Youth, presented a presentation about the KKFYC activities in 2012 and plan for 2013. Sothy Kien and Lenny Thach gave the impressive talk about why the Khmer-Krom youths should join the KKFYC to seek for the freedom for the voiceless people in Kampuchea-Krom. They urged the KKF local leaders to send the youths in their local community to join the KKFYC team and support the youths to attend the UNPFII and the Khmer-Krom Youth Conference. Dr. Cooper gave a quick talk about the meetings in 2013 at the UN and around the world that KKF should attend to effectively raise the issues of the Khmer-Krom. In the afternoon, a special guest, Venerable Loun Sovath, Receiver of the 2012 Martin Ennals Award for Human Rights Defenders, gave an excellent talk about the role of the Buddhist monks in defending the fundamental rights. He expressed his support to KKF for using non-violent as the Principles of Buddhism to seek for the right to self-determination for the Khmer-Krom. Mr. Sarey Chau, KKF treasure, and Mr. Giap Tran, KKF Chief of Administration, presented the financial plan urging members to help raising money to help KKF sustain its work and activities. The meeting is concluded with the adopted resolution as the guideline for KKF to implement its plan for 2013. The KKF leaders around the world expressed their appreciation to thank to all the members of the North Carolina KKF local chapter who worked so hard to host the KKF year-end meeting successful. Previous PostPrevious Happy New Year 2013!